So, you’ve got some good news that you want everyone, their friends and their Great Aunt Helen to know about. Great! That means you need to write a press release to spread the gospel about what you’re doing. Harsh, but true. As a business owner, sometimes you can get wrapped up in what you do to realize that it’s not that big of a deal. You got a new touch screen cash register. So what? Got a new shipment of merchandise. Snooze button. Now, if you’ve partnered with another business to put on a free event to help people learn how to do something. BINGO! There’s the news people care about! 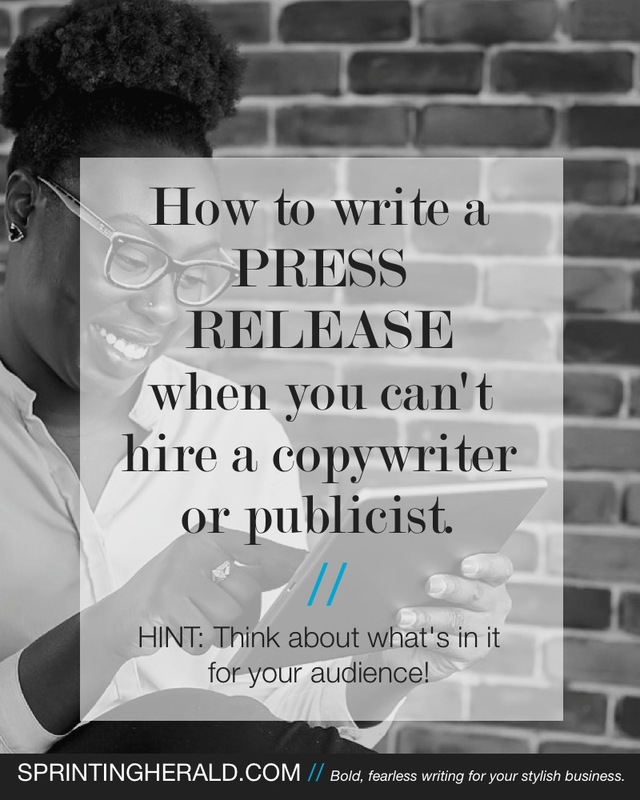 A press release isn’t about you. Your press release is about what’s in it for your reader. Answer questions your audience will have. Make sure you use the 5Ws & H: that’s Who, What, When, Where, Why and How. Writing this way helps you answer the “who cares?” question because it forces you to answer those important and critical questions. Busy reporters will read this and you want to make sure they have all of the information they need up front. Also, it’s okay to use contractions when writing your press release. You want this to be an easy and quick read. Annnnd, keep it short. A press release isn’t meant to be longer than a page. You want the reporter to be call you to get more details, but if she doesn’t, you still want her to have the important info in case she and her editor choose to run your press release as is. Give it a perfect ending. Boil that ending! Your boilerplate is just as important as your first paragraph. It’s the paragraph under the three hashmarks (this: # or this: −30-) that explains the basic information about you and your company. Make sure you add your media contact info to the press release. Don’t make it difficult for a reporter to get in touch with you. These are just my quick tips and advice on writing a press release, especially since we’re coming down to the end of the year and the Holiday gift-giving season. Now get to writing that press release!